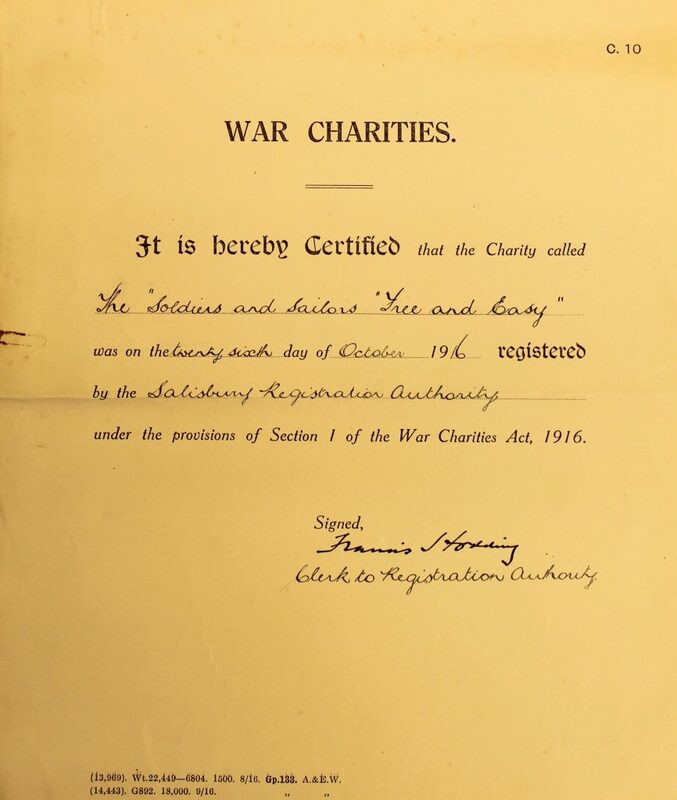 The City Council ran a series of entertainments for servicemen in the Council Chamber and on 26 October 1916 registered the Soldiers and Sailors Free and Easy as a War Charity. 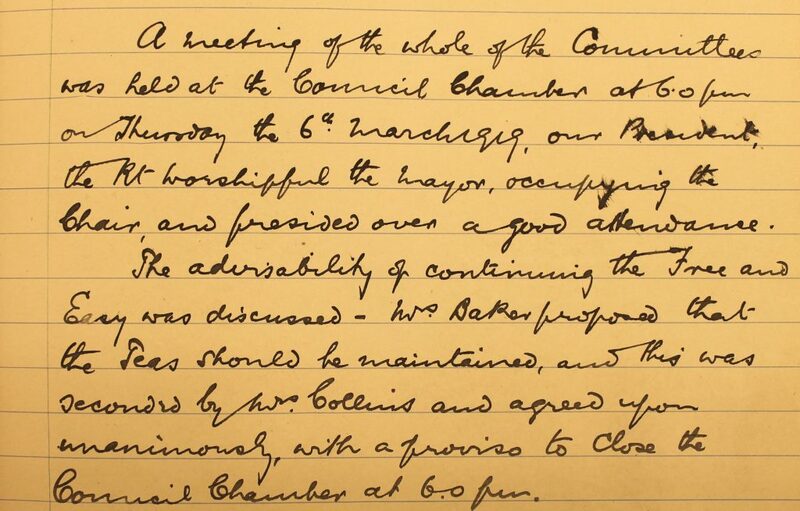 That day the Mayor presided over the first formal meeting which set up a Central Committee, one for Teas and another for Entertainment. It was minuted that teas should be carried on as before, followed by the Concert up to 9.0pm; the one to drift into the other. 18 | Concert Dance to Australians of 3rd Divn. 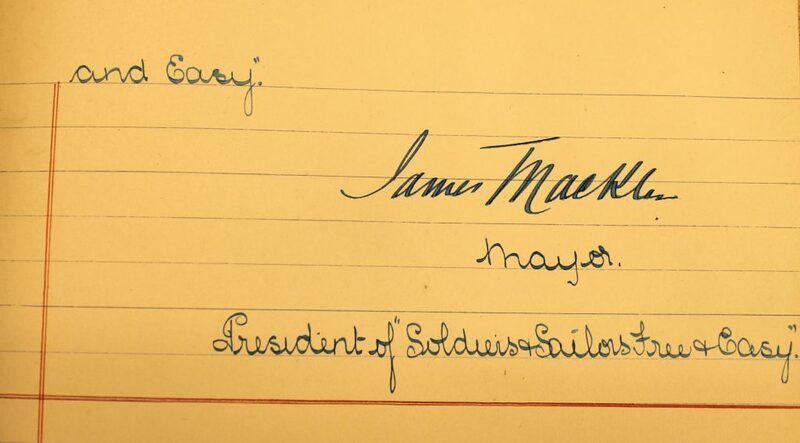 – Farewell speech by Captain Davidson (C.F). 25 | A. S. C. Vaudeville unable to give promised concert, the usual impromptu concert given continued until 9:0pm. 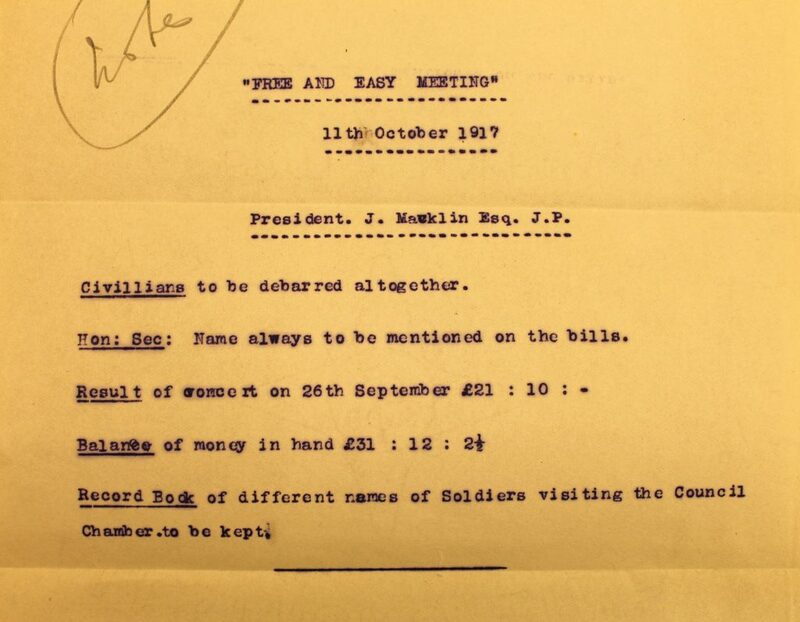 Dec 2 | New Zealand Res: Group (Aling Camp) Band under Band Sergeant Davie. 6 to 7 pm. 7 to 8:30pm A. S. C. Vaudeville Concert Party from Codford Camp. 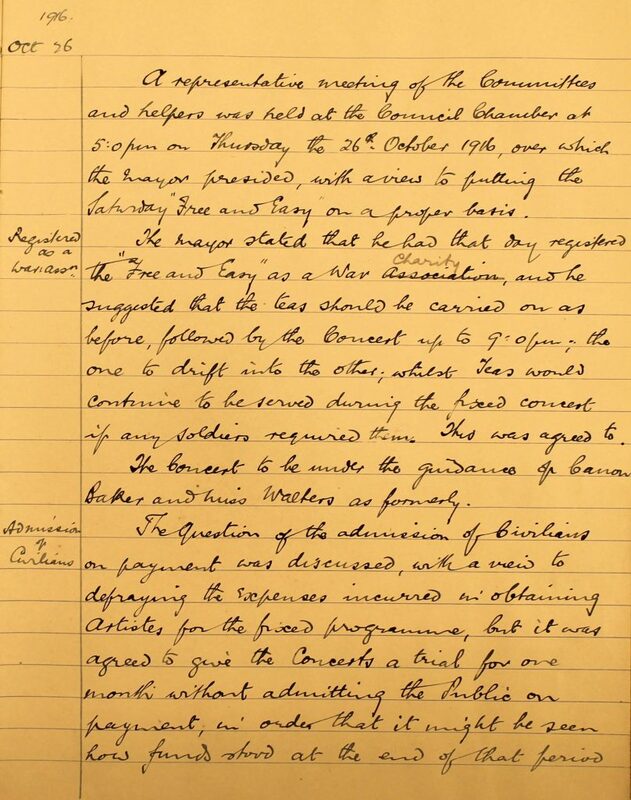 These gatherings proved popular and in December 1916 it was decided in view of the number of Soldiers who attended the Teas and Concerts that there was not room for civilians, other than subscribers and helpers. 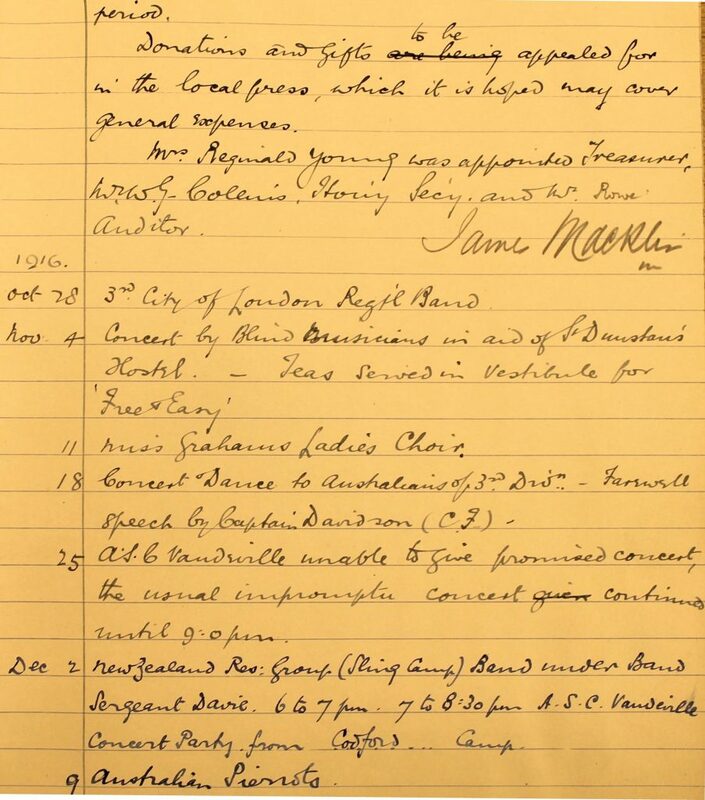 Dec 16 | “The Mudlarks” Concert Party from Bulford Camp under the leadership of Lieut. 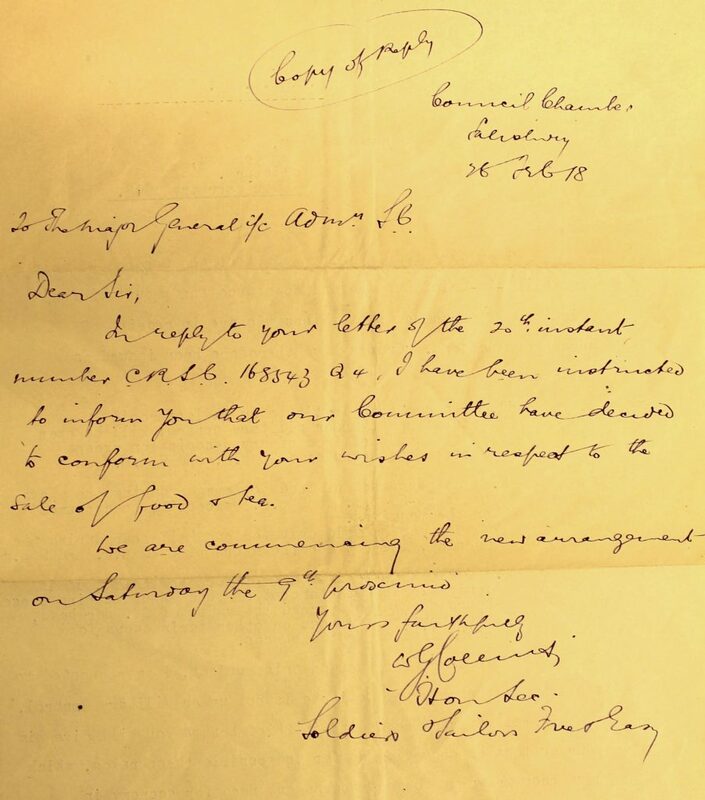 Eveleigh R.F.A. 13 | Band of 3rd Australian Training Bn. Feb 3 | Headquarters Austn. Band from Tidworth under Bandmaster Radford. 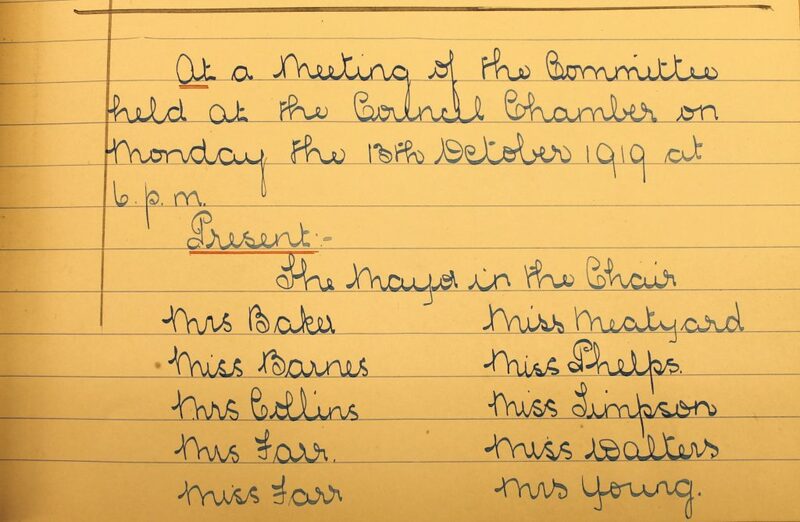 By 11 October 1917, the committe had decided that civilians were to be debarred altogether. 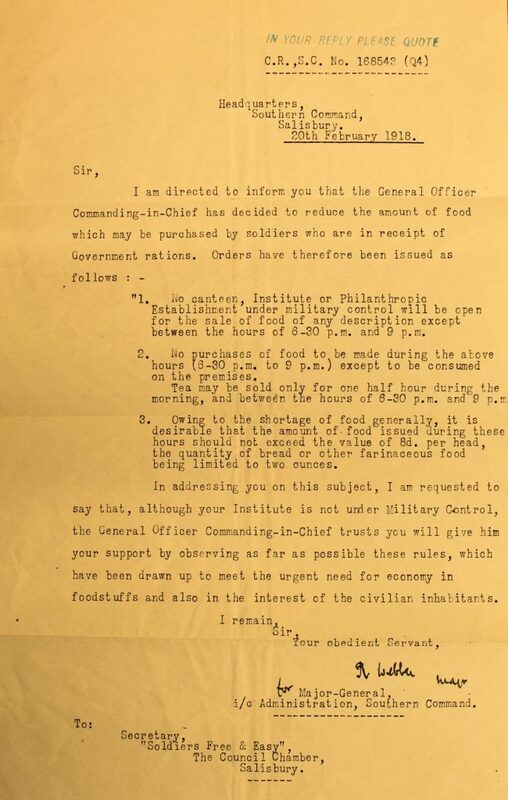 During February 1918 as food supplies diminished the organisers were informed of time restrictions and reductions reguarding food that could be purchased by soldiers in receipt of rations. 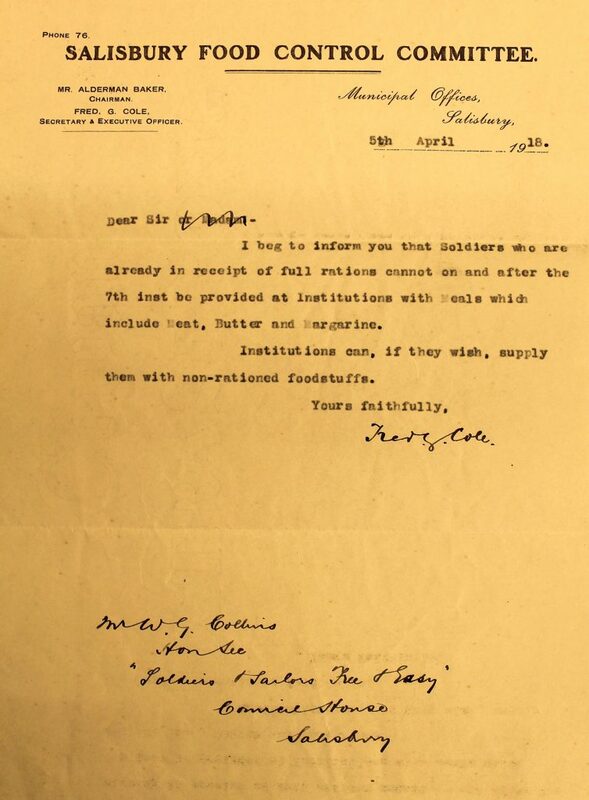 By April 1918 it became even stricter and they were informed that soldiers who are already in receipt of full rations cannot … be provided … with meals which include Meat, Butter and Margarine. 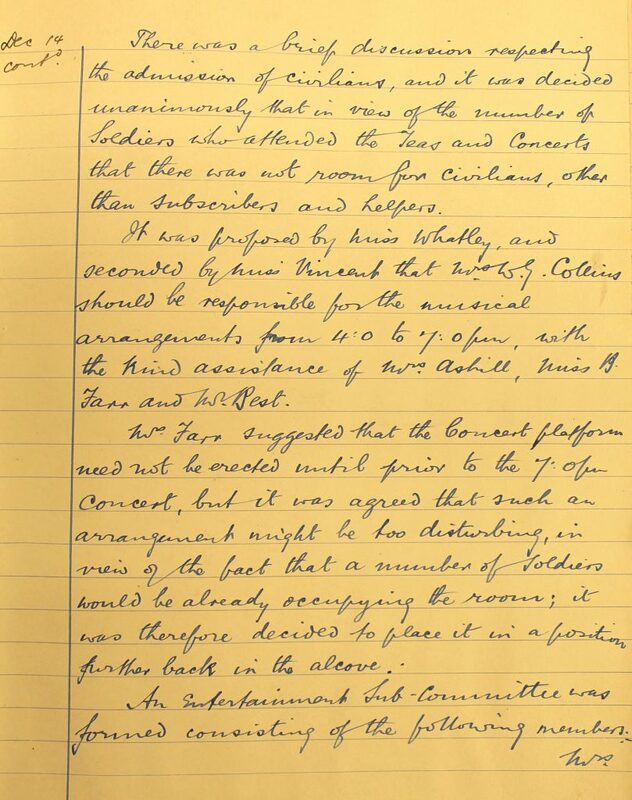 Even after the war ended there were still many soldiers seeking some entertainment and in March 1919 it was decided to continue the teas but to end the concerts. 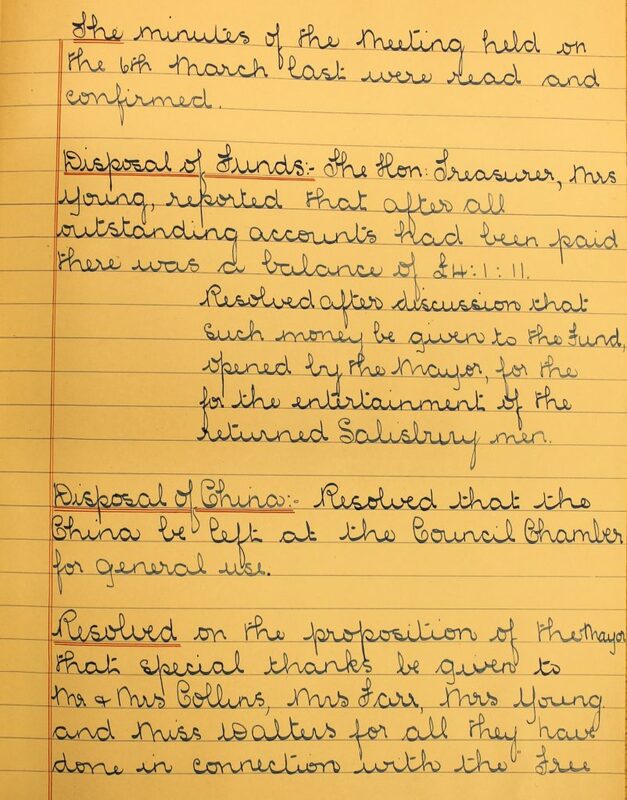 However as demobilisation continued the demand decreased and by October the meetings had ended.